For the first time, Quest has given us a glimpse of the UK's first Nerf Combat Arena due to open on Firday with an official launch on 6th April. Nerf Combat Arena Entrance. I don't like the look of security guards. Pocket Esq. over at Urban Taggers has done it again! He has put his feelers out yet again and this time he has uncovered an article on the Toy News website that reveals the UK release dates and prices of the Nerf Rebelle line. In summary, we will start to see the products arrive in the Autumn. The prices will be as follows. Interestingly, no mention of the Wildshot here. For me, this hammer action revolver was one of the highlights of the range. Does this mean that UK Nerfers won't get a chance to play with one? Three months ago I had just discovered how popular LARP was in the UK. Ever since I wrote this article, I have explored the world of LARP and discovered that they are an amazing bunch. I have been blown away by the strength and diversity of the UK's LARP communities, especially when they all come together to do something truly amazing. 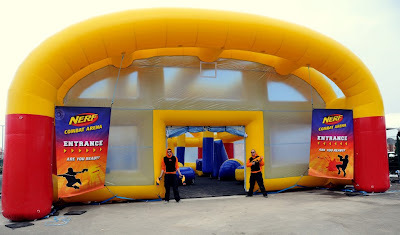 Quest Competition - Win Tickets to the First Nerf Combat Arena. There has been a lot of hype recently regarding the new Nerf arenas due to be popping up around the UK this year. The first of which is at the 'Quest' centre at Westfield's Merry Hill in Dudley. Well, to celebrate the launch of the world's first Nerf Combat Arena, the Quest team are looking for the UK's biggest Nerf fan to win some fantastic prizes. The full press release and details on how to enter after the jump. 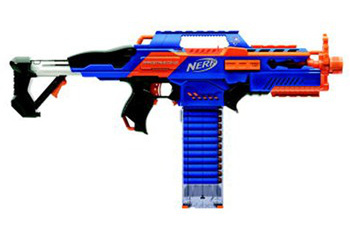 Like many of you, I have been eagerly awaiting the release of the Nerf Elite Alpha Trooper CS-12 ever since we learned of it's existence. But when the advertised release date of March 1st came and went, my heart dropped at the thought of having to wait even longer. I have recently been travelling around the UK with work and took the opportunity to visit as many Argos stores as I could. I have since been to Newcastle, Sheffield, Birmingham, Glasgow, Dublin, Belfast, Nottingham , Liverpool and London but to no avail. 15 stores in total and not a whisper of the Elite version of my favourite blaster. "I have checked this for you and further stock is due on 8th April, please check our website on or around this date for up to date information". So there you have it folks. Not long now! Disclaimer: The information supplied here is purely speculative, based on information gathered from public sources such as from shopping websites that have put up pages for the Rapidstrike. An image and some information about an upcoming Nerf blaster has been leaked. 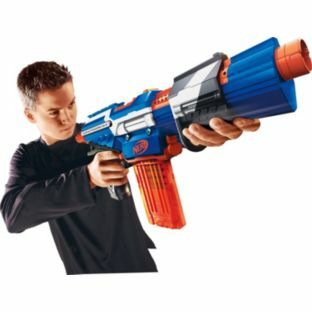 It's called the Nerf Elite Rapidstrike CS-18, and it is Hasbro's new fully automatic, large, "high end" Nerf blaster. It could be said that it is a Stampede replacement. Fully automatic, possibly with semi-auto or burst fire modes as well. Fires up to 3.6 darts per second - much faster than a stock Stampede. Significantly lighter than the Stampede. One source (broken on HvZ forums) claims 75% lighter, making it about 0.8kg. Strap loops/rings! The 3 (below handle, above handle, and by the sight on the front) look fantastic. Similar clip release system as the Stryfe. Come with only one 18-dart clear clip. Overall this thing looks great, as far as I can tell. 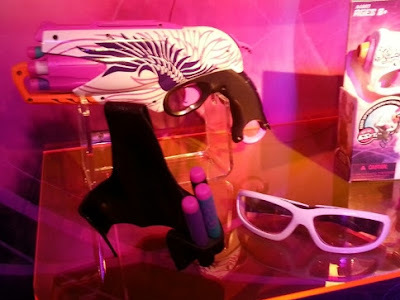 There's currently no known release date for the blaster, but I'd assume it will be this year. I will keep this post updated if I come across any new information. There is a new name in Nerf accessories, and it's British. Elite Alpha Trooper released, sort of!